Founded in 1992, Circuitmaster Designs has built its reputation on the design and manufacture of crimp force analysers for the automotive, electronics and white/brown goods industries. The first field of the companies activity was aimed at crimp quality monitoring of the wire preparation industry. Circuitmaster established the need for 100% in-line crimp force analysis without impacting on production output. The K325 Crimp Force Analyser, developed for Komax Switzerland, was Circuitmaster Design's solution which set the benchmark that all other Crimp Force Analysers would be compared against for many years. An incorrect temperature profile in a reflow or wave Soldering process is proven to cause failures in both electronics components and printed circuit board assembly. The most effective to access to thermal shock to components and PCB is to measure the actual on-board temperatures as it travels through the soldering machine. PROfiler is a six channel high frequency RF temperature profiling system that allows temperature to be gathered and viewed in real time. Standard PROfiler data logger unit is fitted with 6 Type-K thermocouple channels, offering unprecedented measurement accuracy. Two way RF protocol is used between the datalogger and the PC, resulting in zero data loss during transmission. Using RF telemetry, a full screen temperature/time graph can be displayed in real time allowing process engineers to make rapid process decisions and minimize production Down time. 10,000 data points per channel can be held within the loggers memory, whilst RF real time telemetry system shows the profile as it happens. Save multiple types of information into a template for future production runs such as oven configuration, tolerance indicators, thermocouple placement. 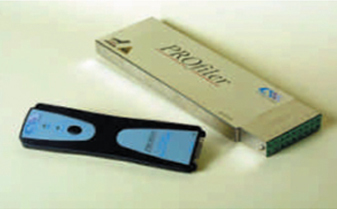 Prowave working together with the PROfiler range of dataloggers, will monitor and report all critical parameters of your wave soldering process. 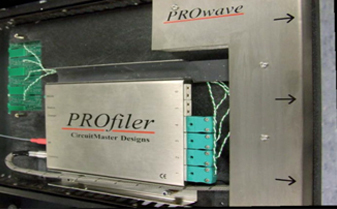 Send the PROwave pallet through your wave soldering machine and accurate measurements of key process parameters are recorded for download to a PC. The solder wave is monitored across its entire width, making it now possible to detect voiding or machine parameter fluctuations at points all along the wave. 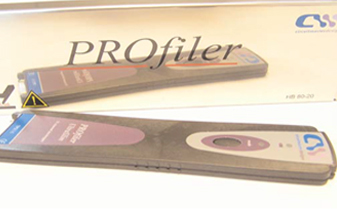 Monitor up to 6 channels of temperature profile information with the PROfiler datalogger. View 2D solder wave contact area map and dwell time graphs on screen. Analyse pre-heat temperatures, conveyor speed and parallelism. Save and print a complete record of your process with the PC Software. Reduction rework and production costs. Increase process Tracebitlity on all key process parameters. Overlay previous profiles to analyse the repeatability of your process. Print a comprehensive SPC report providing, dwelling times, belt speed, min/max temperatures along with many more key parameters. In an industry that places ever increasing demands on process quality and productivity, along with the emergence of lead free processes, temperature profiling has never been so critical. The UltraSlim range of temperature profiling systems will give you confidence and control over your reflow and wave soldering process. Existing or new lead free profiles can be rapidly captured and analysed, allowing you to reduce productions costs and machine downtime. Ease the move to lead free solder. Reduce scrap and rework costs. Ease process control documentation & overhead. Use your profiles to maximise production throughput. Improve process quality and consistency. Measure and monitor process improvement. 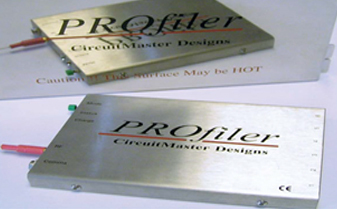 Capture the known good oven profile using the PROfiler datalogger and your test PCB. Using this information, PROsentry analyses oven fluctuations and calculates resulting process parameter changes for each board that passes through the oven. Process and machine rule checks are performed to determine if parameters are within tolerance, alarms or machine signals can be automatically generated if any limits are exceeded. Multiple measurement points within each zones on the largest of reflow ovens. Quickly interface with conveyors systems for controlling product entering the process. Machine shutdown or operator annunciation can easily be achieved. Release’s the need for an additional PC serial port to be present when software is installed on oven PC. Even under PC or communication failure PROsentry will store all critical data from the process. Allows lost board detection, oven loading and throughput tracking. Provides easy interfacing to third party site management schemes.